A good rule of thumb: If Media Matters attacks someone and tries to repudiate their message, the person or persons attacked and the message are true. Very doubtful that it was a robbery. Wikileaks offered a $ 20,000 reward for information about the murder. Why did Wikileaks offer a reward? Why is the DNC and left so focused on the Russian Narrative? Julian Assange all but named Rich as the source of the leaks. Seth Rich had access to the data. Kim Dotcom stated that Set Rich was the source. These are but a few of the compelling facts surrounding this case. If you believe that Rich’s murder and possible involvement in the leaks should not be questioned, you just don’t care or you’re an idiot. Tagged It all points to Rich murder for leaks, Seth Rich was murdered, Who murdered Rich and why?, Why are Media Matters and other left organizations attacking Hannity and others asking questions?, Why did Wikileaks offer a reward? Obama, et al are ruining this country and it’s economy. Today we learn from the US Labor Department. The US Census Bureau just reported. “Another 2.6 million people slipped into poverty in the United States last year, the Census Bureau reported Tuesday, and the number of Americans living below the official poverty line, 46.2 million people, was the highest number in the 52 years the bureau has been publishing figures on it. The reported unemployment rate remains at 9.1 %. The tax and spend policies of Obama and his cronies are a huge part of why this economy is tanking. Obama is more concerned about getting reelected than he is the lives of ordinary struggling Americans. He speaks of creating jobs (with the worst past performance on record) and raising taxes on businesses to do so. The next part is important. Pay Attention! Businesses do not pay taxes. Consumers do! 1. Prices will be raised. 2. Employees will be let go or have reduced hours. 3. Hiring will be diminished. We have enough revenue. Cut spending! One of the biggest, if not biggest drains on the economy, one exacerbated by Obama and his cronies, is gasoline prices. This affects the cost of everything and is killing our economy. The left are so concerned about theoretical environmental damage and emulating Europeans that they disregard the plight of average Americans. Below is a chart showing the rise in fuel prices during the Obama reign. I am all for alternative energy initiatives that make sense and are not in place to enrich Obama supporters. In fact, I have done so myself with my own limited funds. However, gasoline prices are hurting this economy and the poor and middle class citizens who the Democrats pretend to represent. From the Chicago Tribune September 8, 2011. He will use his televised speech before a joint session of the U.S.
European debt crisis spooked businesses and consumers. have pushed for immediate cuts in the deficit. economy needs a short-term fiscal boost. responsibility for making the economy worse. What Obama stated on March 3, 2009. Reinvestment Act, the most sweeping economic recovery plan in history. And already, its impact is being felt across this nation. and upgrading the buses and trains that commuters take every day. an eye on how precious tax dollars are being spent. To you, he’s Mr.
From The Blaze October 13, 2010.
the least of which was the American Reinvestment and Recovery Act. Hurricane Irene and Earthquake, Washington’s Apocalypse This Time, King memorial dedication postponed, Congressman Goodlatte investigations? From Time Aug. 26, 2011. “Washington is accustomed to turmoil (debt ceiling, health care reform, the occasional Supreme Court nomination) but rarely has a week here seemed so apocalyptic. First came Tuesday’s 5.8-magnitude earthquake, the first in more than a century, which cracked the Washington Monument’s top and sent the tip of one of the National Cathedral’s spires to the ground. Then, there were the aftershocks. 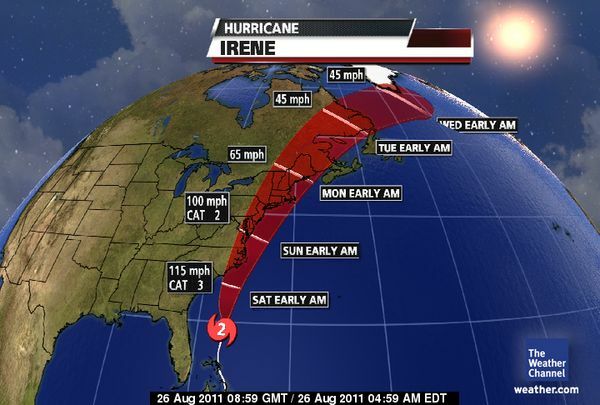 Now comes Hurricane Irene. The authorities expected Irene to arrive between North Carolina and the tidewater region of southern Virginia Friday night, with winds up to 110 miles-per-hour, before barreling up the Eastern Seaboard, toward Washington and New York, one of the continent’s most populous corridors. President Obama on Friday predicted the storm will be “extremely dangerous and costly,” and abruptly ended his family’s vacation on Martha’s Vineyard to return to the White House. In New York City, Mayor Michael Bloomberg ordered the evacuation of some 270,000 residents of low-lying neighborhoods, and ordered the city’s public transportation system closed Saturday. New Jersey Gov. Chris Christie urged residents along the Atlantic Coast to flee. Back in Washington, where Mayor Vincent Gray had yet to decide whether to declare a state of emergency Friday afternoon, the officials postponed Sunday’s scheduled dedication of the memorial to Martin Luther King Jr.
“He may have geography and physics to back him up, a bit. Washington is relatively far inland, and sits along the Potomac River, not the Atlantic Ocean where the risk of a storm surge is much higher. But the authorities say the risk of severe flooding within capital city is minimal. The greater threat is of wind uprooting trees from soil saturated by weeks of heavy rain. Does Obama see this coming? Congressman Bob Goodlatte has stated that Barack Obama will be investigated if enough evidence surfaces. From the Weather Channel August 26, 2011. “Hurricane Irene, a large, powerful Category 3 hurricane on the Saffir-Simpson hurricane wind scale, continues to plow through the northwest Bahamas, with the U.S. in its sights. We remain a couple of days away from Irene’s direct impacts along the US East Coast and critical uncertainties related to Irene’s exact track and intensity remain. Stay tuned to The Weather Channel and right here on weather.com for further updates. A second earthquake has hit Virginia, this time 86 miles from Washington, DC. The quake, magnitude 2.5, comes after a stronger one this morning that was 4.5. 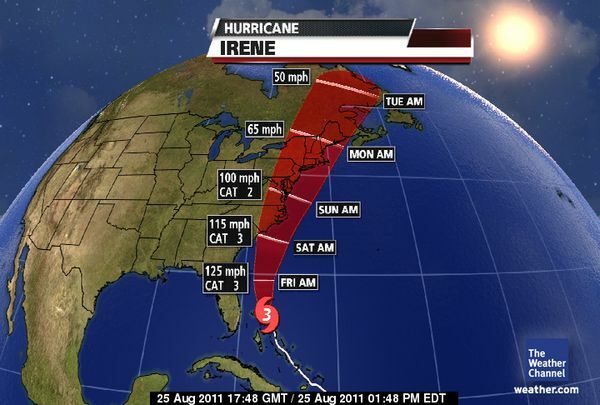 The projected path of Hurricane Irene is more westerly than believed yesterday and is aimed right at Washington, DC.